Sunday's first post-Tim Russert edition of NBC's Meet the Press fittingly began and ended with a shot of the now-empty chair and desk from which he so ably presided since Dec. 8, 1991. In the cold, hard realities of network television, that somber image begged a big question. Who will be Russert's replacement in an electrifying election year during which Meet the Press again has been the dominant force in Sunday morning public affairs television? NBC would be wise to turn to one man on at least an interim basis. Tom Brokaw, in semi-retirement but every bit the political junkie that Russert was, is the only successor who could stem any flow of Meet the Press's audience to ABC's This Week with George Stephanopoulos, CBS' Face the Nation (with Bob Schieffer still in the saddle) or Fox News Sunday, moderated by Chris Wallace. Brokaw, who hosted Sunday's tribute to Russert, might not be willing to take the job long-term. But the guess here is that he'd gladly honor his friend and colleague by at least helming Meet the Press through the presidential election or maybe all the way to Inauguration Day. NBC in reality doesn't have any other in-house candidates who come close to matching Brokaw's stature and clout with politicians and audiences. David Gregory isn't well-known to most viewers, Chris Matthews is way too toxic and Joe Scarborough isn't far enough removed from his very public support of George Bush during the 2004 election, in which he cheered for him at rallies. Andrea Mitchell, particularly in the year of Hillary Clinton's run for the presidency, might well be the best fit if Brokaw demurs. She's savvy, battle-tested and long has revered Russert. But The Greatest Generation author, who at 68 is three years younger than Schieffer, easily is the optimum choice to fill the gaping Russert void while NBC regroups and charts Meet the Press's long-term future. 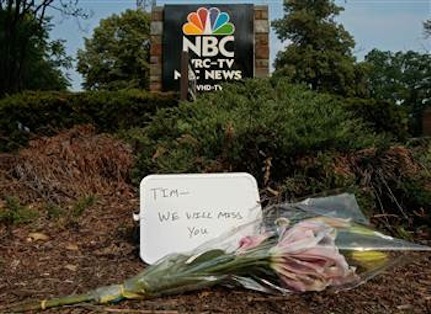 On Sunday's tribute, Brokaw noted a sign in Russert's office that says, "Thou Shalt Not Whine." "Thou shalt not weep or whine this morning," he then told his assembled guests. "This is a celebration, a time to remember." But it was Brokaw who almost lost it down the stretch, his voice breaking as he said, "I hope I can get through this. He (Russert) would always say what a great country this is." Russert didn't walk on water and won't be canonized. But he took Meet the Press from Sleepytown to Electric Avenue during his long and eventful tenure. "This was where you separated the men from the boys. You weren't a candidate until you came on this show," said longtime Republican strategist Mary Matalin, a frequent Meet the Press guest. "This studio I thought of as the Church of Tim," added PBS veteran Gwen Ifill, another regular. It could and should become the Church of Tom for a transition period or longer if he's willing. Brokaw, as did David Brinkley before him on ABC, still totes a lot of heft in his autumn years. He's the man for this job. And if Russert could still say so, he would.